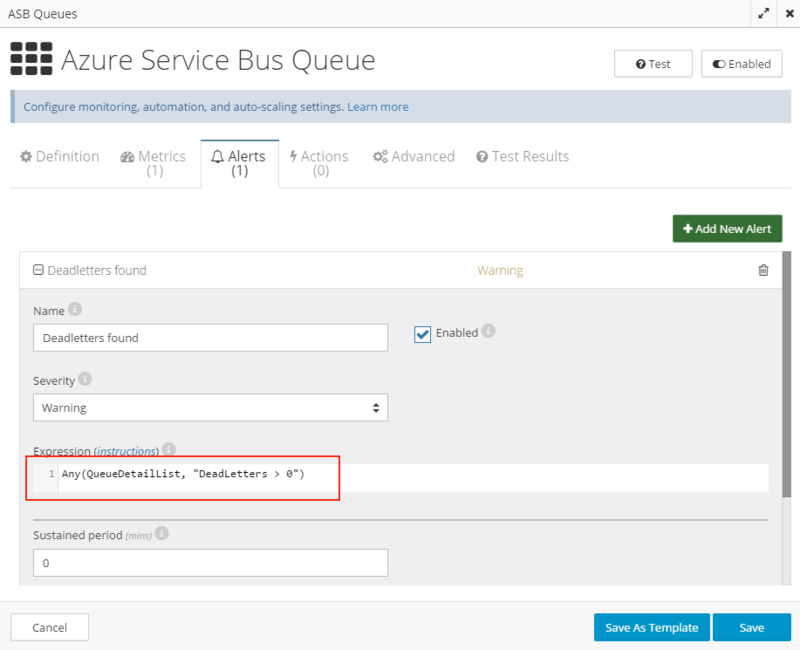 Knowing when messages are being dead-lettered by Azure Service Bus queues is extremely important for monitoring of the overall health of a system that relies on ASB queues for message delivery and in-app or inter-app communication. CloudMonix provides a number of ways to track and monitor for deadletter messages, each with its upsides and downsides. Any of these methods can be used together with others. Learn more about detailed information on what metrics are availble for monitoring Azure Service Bus here. Capturing and tracking a metric of type AzureServiceBusQueueDetailsList. This metric allows for tracking of all (or some ODATA-filtered) queues within a single complex collection-based metric. Alert on when some queues in this metric contain deadletters can be accomplished with an alert that uses aggregate expression: Any(QueueDetailList, "DeadLetters > 0"). Users will know in the alert text which queue(s) caused the alert to fire. Downside of this metric is that it is not represented visually over time, but rather as a collection point-in-time. Furthermore, since this metric is not a numeric metric, data retention for this metric is approximately 30-60 days.